2014-15 saw the inaugural The Door Fantasy Football league – with 20 people pitting their tactical knowledge of the Premier League against each other in order to raise funds for The Door. 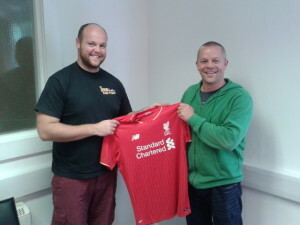 Last years winner was Liam Eaglestone, minister at Minchinhampton Baptist Church, Liverpool supporter, and Fantasy Football expert. With the new season just a couple of weeks away, The Door is again looking for budding Mourinho’s & Wenger’s to sign up. Whoever comes top of the league at the end of the season will receive the football shirt of your choice.